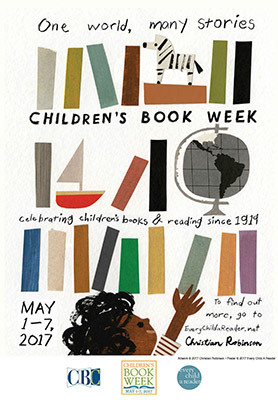 Do you have a young child who is eager to learn like their older brothers and sisters? Are you wanting to give your child a head start in preschool? 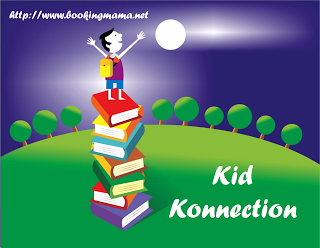 Are you looking for some activities to keep your child learning throughout the summer? This book is just what you are looking for. 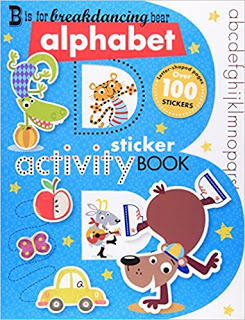 This sticker activity book is full of fun activities that cover every letter of the alphabet. One page is cut out in the shape of the letter. The opposite page offers space for tracing both the capital and lower-case letters. The pictures use the letters and offer items to color like a goat playing guitar and your child can color the guitar. The next two pages for that letter offer more activities such as counting, tracing, coloring, or using the stickers also included in the book. There are two pages of stickers included that are used throughout the pages of the book. The cutout letters can be torn or cut out and hung up to continue your child’s learning. The pages are a heavy cardstock and offer that “school quality” so even your toddler will feel like they are a “big kid”. 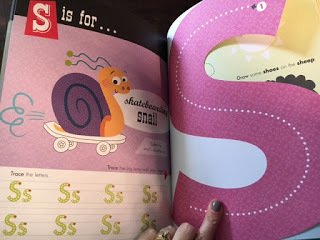 The pages aren’t overwhelming and just doing one letter at a time, they would learn several different activities like writing, tracing, coloring and reading. 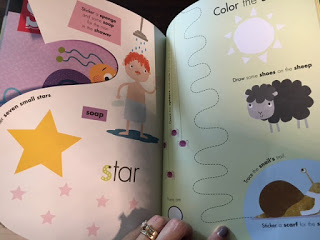 I think this activity book is super fun and wish I would have had it for our kids. Children ages three and up would benefit from the learning offered in this book. Since I work in the school system, I’ve noticed that children are expected to learn things so much sooner than our children did. The material offered in this book is definitely being taught in our preschools and sharing this book over the summer months would prepare your child even more for their first year of preschool.